For those of us that are blessed to live in the Lower mainland and Fraser valley of British Columbia we have a great wealth of fishing opportunities at our disposal. In the past decade fly-fishing has become a very popular technique for pursuing most species. As we draw closer to the fall months of the season, (September, October and November) many fly anglers thoughts become preoccupied with the impending onslaught of the countless numbers of Salmon that will be entering the local rivers on their annual upstream spawning migration. Every season there will be many seasoned and experienced fly anglers on the waters utilizing this world class fishery, there will even be hundreds of anglers traveling from all over the globe to experience what many of us take for granted. But there are still many more that have always thought that I should give this fly-fishing for salmon thing a try. My question is... what are you waiting for? The autumn of 2005 is as good a time start as any and as this season is "pink" year so success is pretty well assured. Basically all 5 species of salmon will be available to fly anglers this season so its time to get rigged up and toss some feathers for Pinks, Sockeyes, Cohos, Chums or even a Chinook as all five species can and will be caught using a fly rod this year, the question is... will it be you? As previously mentioned all 5 species of salmon are available to fly anglers, the key to any fishing particularly fly-fishing for salmon is timing! You must fish when the fish are in and when the water conditions are right. 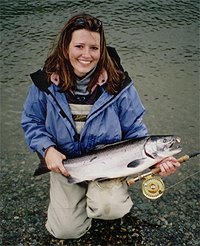 Sockeye salmon are not usually sought after by fly anglers but they can be taken on a fly. 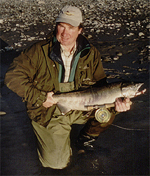 The Fraser River, Chilliwack River, Harrison River and Pit rivers all have runs of Sockeye. Sockeye start entering the rivers in late June and continue until mid September. Pink Salmon will assault the Fraser valley this year and there will literally be millions of "Pinks" swimming up the Fraser, Stave, Vedder and Harrison rivers this season. The last time the pinks ran in 2003 the total count was 26 million fish!! You have heard of the term fish in a barrel, well it applies here. Pink salmon only run every two years so 2005, 2007, 2009 etc. This is the perfect fishery to get your first Salmon hook-up on the fly. You really just can't miss! Pink Salmon start showing up around mid August, but prime fly-fishing time starts in early September and runs till about October 10th. 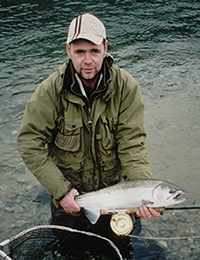 Chum Salmon are a great fish to target on a fly; they are big, aggressive and plentiful. Chums are available in most rivers and sloughs and are highly visible as they are large and always seem to be flopping around on the surface when around. Chum salmon usually start to show up in late September and run till late November. Coho Salmon are certainly the glamour species of all the salmon to swim in the fall. Coho are known for there acrobatic antics and just seem to be made to catch on a fly. Coho's are also known for there tendency for a moody disposition, one day they attack all flies with complete abandon and the next they hardly seem interested. I think that this really adds to their allure. Coho salmon start to show up in late September and run until late November. Most fly anglers do not generally pursue Chinook salmon, but this does not mean that it is impossible. Chinook are the largest of the Pacific Salmon and often prefer deeper and faster water than their smaller cousins. Timing and location are the keys to success hear. Chinook start showing up in late may and run until late November. Selecting the appropriate gear for fly-fishing is very important. Having the right tool for the right job is critical. This is a specialty fishery and the 5 or 6wt you use for interior lakes rainbows will not work hear. Everyone has heard the guy who says that he can catch any salmon on his 6 wt and yes this can be done but keep in mind that you really won't have the muscle to work most salmon properly and in faster water just forget it, you won't have a prayer. Most fly anglers will release most of their catch and if you can not tire the fish out in a reasonable period of time, then the fish will have excess stress imposed on it and mortality rates will go up! We need to be responsible as anglers and make sure we can play our fish quickly and release them with the best possible chance of surviving to spawn. Also keep in mind that you will need a rod that is capable of throwing some very heavy lines at times and a 6 wt will not get the job done. A good place to start is a 9 or 9.6-foot rod in an 8 or 9wt, this will allow you to handle pretty much any situation and any Salmon species that you may come across. Fly rod technology has vastly improved over the years and because of this you can purchase some very good performing fly rods for a reasonable price. For most good quality entry level fly rods in this category expect to pay between $150 and $300 dollars for the rod. There are many manufactures and models to choose from, so a little research and shopping will be in order. Fly reel selection is also very important. For most trout anglers a fly reel is usually used as a line storage device so drag systems are not that important. For Salmon however, you will be using the reels drag system, so a suitable and durable reel is necessary. You will need a reel that can hold at least 150 yds of 30lb backing as well as a complete fly line. The other consideration with fly reels is their spools. You need to purchase a reel that has extra spools readily available at a reasonable price as it is quite likely that you will need 2,3 or even 4 extra spools to house all your lines that will be required for all of your fishing conditions and locations. A good quality fly reel suitable for Salmon fishing that will last more than a run or two will set you back at least $100 and it is easy to spend a lot more so you need to look at this as a long term investment you will get what you pay for. Fly lines are always the topic of much debate among all fly anglers, and fly-fishing for salmon is no different. Different types of water conditions will require different lines. Because this is a demanding and specific fishery specialty lines will be required and there is no cheap way out, expect to spend $60 to $80 per line. There are several high quality line manufactures available, Cortland, Scientific Anglers and Rio all make lines that will meet your needs. For the most part you can pretty much forget about a floating line. What you will need is a selection of sinking tip lines that sink at different rates to match whatever water condition you may encounter. My first choice would be a Ghost tip line. This fly line has a clear tip for the first 15 feet and has a slow sink rate. This line is perfect for slow or still backwaters and sloughs where you only need to get down a couple of feet and you are looking for cruising fish. Ghost tip lines are also very nice to cast as they feel much like a floating line. Next you will need a selection of fast sinking tips for faster water. Most company's now offer a selection of factory shooting heads. These lines are not particularly nice to cast but they do get down to the fish. These lines are available in line weights from 200 grains up to 500 grains and they are not rated according to line weight but buy grains so basically you will match the line to the river condition not the rod. Most fishable river conditions will require 200 or 300 hundred grains. If you need more than that than maybe a new location is needed as 400 and 500-grain lines are no fun to cast. The third option is a multi-tip system. These lines cost more but it is basically like getting four lines at once. Multi-tips consist of a running line and belly section with a loop attached and then usually four different tip sections that also have a loop attached. You simply choose the desired tip and attach the tip and main line via the loop to loop and you are in business. Additional tips or heads can also be purchased as required and the cost is much less than a complete fly line. A further benefit is that you do not require additional spools for your reel as the running line is all that is permanently attached to the reel. The down side to the multi tip system is that you will feel the loop as it runs through the rod guides. Multi-tip lines usually cost around $150 this is a good deal as this is like getting four lines for the price of two and additional tips or heads will run around $30 to $50 dollars per unit. Flies... where do I start, well I think this requires a whole separate article, as there are more patterns than you can possibly imagine. Fly selection depends on location, species and water conditions. The best advice I can give here is to do a little research. There are many books devoted to the subject, not to mention the Internet. Also, your local tackle shop can be invaluable here for a base line selection. Start with some bright Marabou flies. Pinks, orange and purples in sizes 2 to 1/0 are very good in faster water and are also very good for Chums and Pinks. Don't forget the Pinks. This is a Pink year so get ready there will be millions of them and they love pink Marabou flies. Bead heads are also very productive, as they give the fly a real undulating action when retrieved. For Coho you will also need a selection of smaller, sparser patterns in sizes 8 to 4. Muddler minnows in gold and silver with and without bead heads and very productive as are Mickey fins and bead headed woolly buggers. Don't hesitate to use drab olive colors on bright days brighter flashier colors on darker days. Have a good selection of flies and don't be afraid to experiment. Having all the right gear and the proper flies is important but fishing the right water, and using the proper techniques is just as important. All species of salmon will be found in basically two water types; regular rivers with standard swift moving runs and pools, and back waters and sloughs with slow moving or almost still water conditions. Runs and pools are generally fished with fast sinking tips and shooting heads. In these waters the Salmon are generally on the bottom so you must present your fly along the bottom if you are planning on hooking a fish or two. This is generally done by casting cross current and allowing the line to sink and swing just off the bottom in front of the fish. This will take a little getting use to and will require mending the line for a proper presentation and depth. Also, you may have to experiment with line selection as well to get it right. This can be a very effective method to catch salmon and also very exciting as well because when you do get a strike there is generally no doubt as a good solid yank is usually the result. Fishing a fly deeply in this manner is very productive for all salmon species. 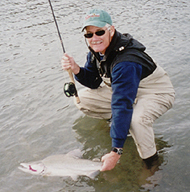 Fly-fishing for salmon in backwaters and sloughs requires a bit more finesse. The chuck and duck method as previously described is fine in the fast flows but the still and slow water requires a little more stealth and precision. Personally I find that the Ghost tip slow sink tips are perfect for this application. Smaller sparser patterns are also called for hear. Usually you will be fishing in 3 to 5 feet of water so deliberate casts that don't touch the water until they are laid down are very important. In these waters the fly is cast usually to the anglers limit then retrieved in a brisk striping action. On of the biggest mistakes most anglers make is that they do not strip the fly in far enough! It is very important to strip the fly right to the rod tip I can not tell you how many fish I have taken two feet from my rod tip, Coho are famous for this. If you don't do this you will miss, fish I guarantee it. In many backwaters and sloughs you can see the fish milling around, and often you will see them chase and take the fly. This is as good as it gets, this is what fly-fishing for salmon is all about. I have caught all five species of salmon in backwaters and sloughs. However, Chinook are a rarity here, as they do prefer faster water, but Coho, Pinks, Chums and even Sockeye can readily be targeted in this exciting fly-fishing venue. For many people fishing is a journey, a journey with many stops on the way. Fly-fishing is a major stop on this journey. For some this becomes a permanent location and others fly-fishing adds to the overall experience and becomes part of an angler's overall repertory. Whether you become a exclusive fly angler or an angler who also fly fishes is a personal choice and a choice whose answer will vary from angler to angler. There is no wrong answer. The only wrong choice as far as I can see would be to not try it at all. The Fraser valley is blessed with a world class fishery and living here and not taking advantage of this tremendous fly fishery and opportunity to catch Pacific Salmon on a cast fly would truly be just plain wrong!